The $1,500 buy-in no-limit hold’em and pot-limit Omaha event at the 2016 World Series of Poker drew a field of 919, creating a total prize pool of $1,240,650. The final 138 players made the money, earning a minimum payout of $2,254. 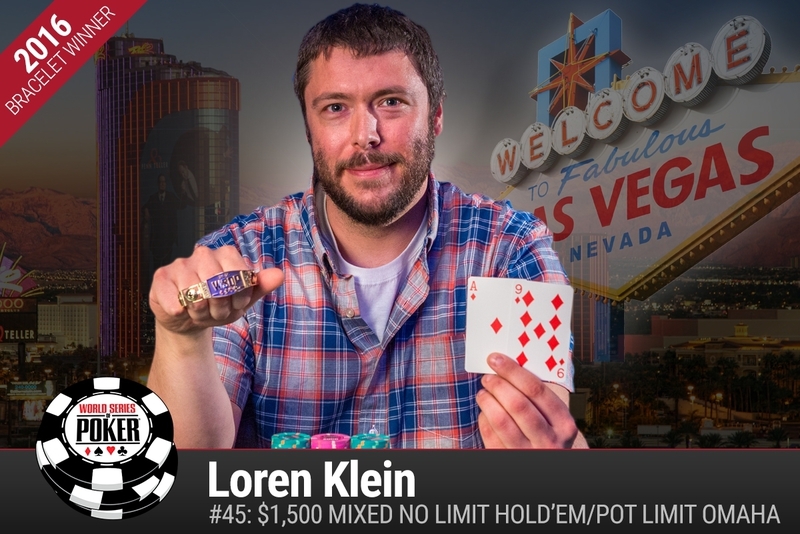 In the end, it was 34-year-old poker pro Loren Klein who came out on top, picking up his first career gold bracelet and the $241,427 first-place prize. The Verdi, Nevada native dominated the final table and left the rest of his competitors essentially playing for second place. “You have to use a different strategy when you have that kind of chip lead,” Klein said. This was the biggest score of Klein’s career. His previous best finish came in the 2010 WSOP when he took second place in a $2,500 pot-limit Omaha event for $195,147. He now has more than $750,000 in live tournament earnings. The event featured a split of poker’s two most popular games in no-limit hold’em and pot-limit Omaha. Other recognizable faces to make a deep run in the event included Kyle Bowker (10th), Ashton Griffin (16th), Jason Dewitt (17th), Dan Buzgon (18th), John Racener (19th), Brandon Shack-Harris (20th), Dan Heimiller (25th), Shannon Shorr (29th), Kevin O’Donnell (30th), Antonio Esfandiari (35th), Barry Greenstein (37th), Martin Finger (39th) and Humberto Brenes (40th). For more coverage from the summer series, visit the 2016 WSOP landing page complete with a full schedule, news, player interviews and event recaps.